Wow. What a dull design. Thanks for the link, BTW. Ugh, another less than thrilling design. Cards are supposed to be about the picture of the player and the pictures seem to be getting smaller. 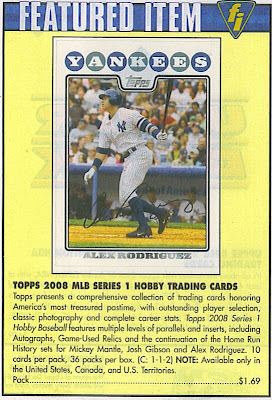 The "Topps" logo appears to be an after thought and really detracts from the card. On first impression I am not inspired by the design. I am anxious to see the 50th Anniversay Topps All Rookie Team cards. Why would they need 180 cards for the year in review? I think you may be right in smelling a rat there.